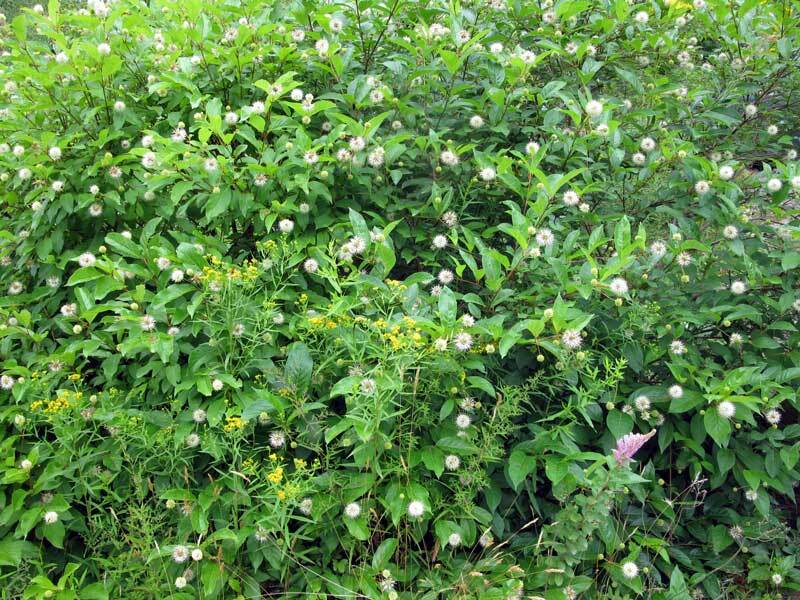 Cephalanthus O. has expanded into a multi-trunked thicket down by the lower driveway in the culvert ditch that leads to the swamp. Over the years the seeds (which are really “nutlets”) have dropped into the run-off in the spring, traveled through the culvert and seeded themselves along the stream into the swamp in a meandering trail of white, puffy blossoms buzzing with bees. 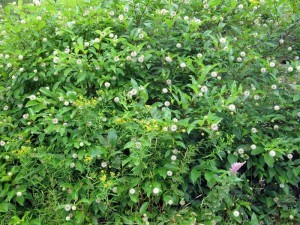 The Buttonbush, or Button-willow, is a member of the coffee family and native to the NE US. Bouncing Bet, or Soapwort, is in full bloom and covered with bees in the afternoon. They don’t seem to like it as much in the morning, perhaps it needs to warm up to produce a nectar flow? The plant contains up to 20% saponin (careful- toxic!) 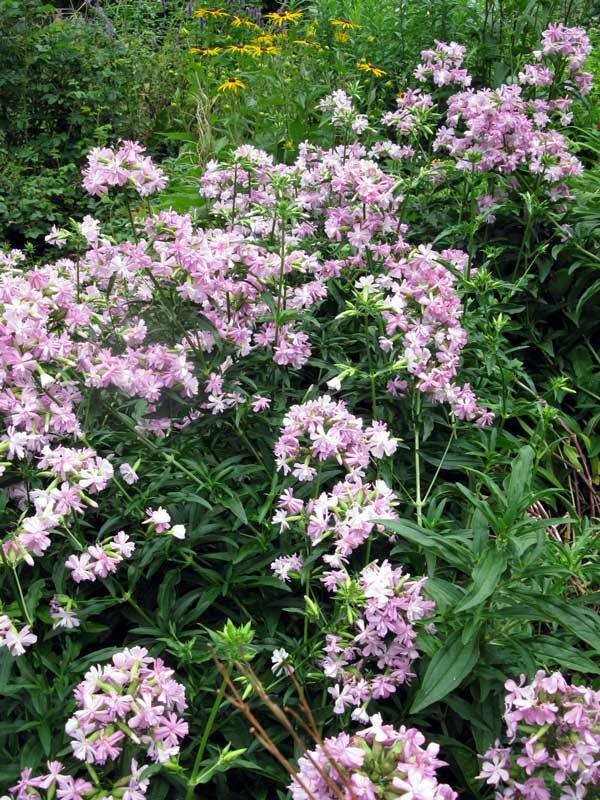 in the roots while in bloom, and even the leaves and stems will make a nice lather. 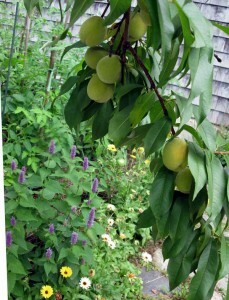 The peaches are coming along in the front yard. I expect the first ones to ripen in 3 weeks or so. Anise hyssop (for tea) and calendula o. (for salve) surround the tomato beds in the background. 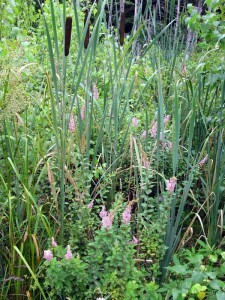 Meadow-sweet has spread through the wild garden as cattails have increased the ratio of soil to water over the years. 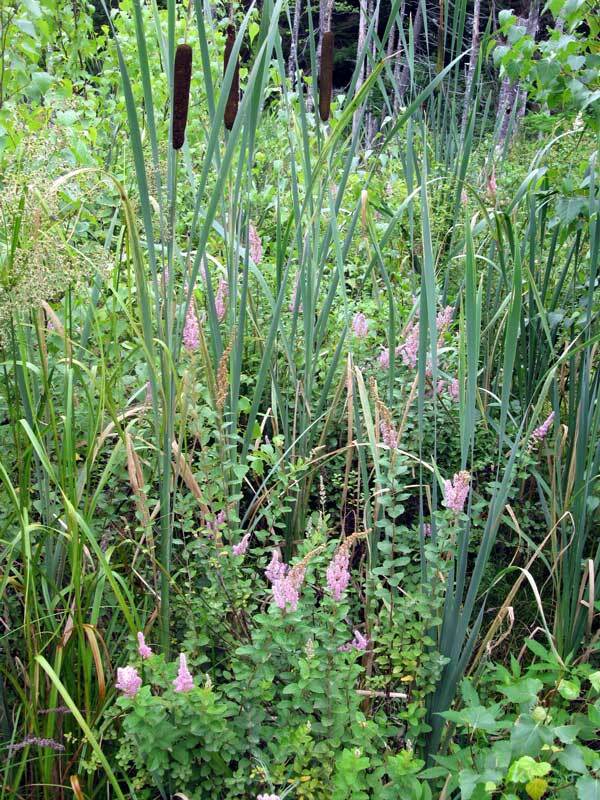 Next year I’m going to try harvesting the cattail shoots. The bees are all over the meadow-sweet which, like goldenrod, blooms in the heat of high summer. This entry was posted in bees, gardening, horticulture, orchard, perrenial, the backyard, vegetable garden and tagged Bar Harbor, bees, garden, orchard fruit, summer on August 6, 2011 by APo.